The Sheep Whisperer: Spring is in the Air! Springtime is a wonderful time of year. Life is bursting forth all around us! Rays of much needed sunshine warm our sun-starved bodies, as we look forward to "Old-man Winter" leaving us for another year. Hope & optimism are in the air, as we anticipate what God is going to do in this new "season" of our lives! For Icelandic ewes, Spring is a time for giving birth to lambs, multiple lambs ! Icelandic Sheep are TOUGH CUSTOMERS! treasured for their wool. Finally, they're esteemed for their milk. Sounds like a winner! Did Ewe know that I have genes that Shepherds admire? 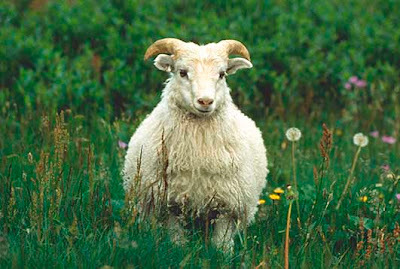 Icelandic sheep are a mid-sized breed, ewes weighing on average 130-160 lbs. 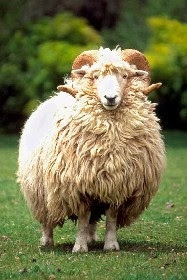 & rams averaging about 180-220 lbs.,& sporting a short, fluke-shaped tail. 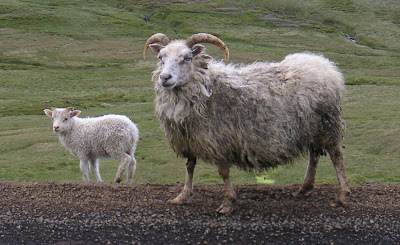 Icelandic sheep are generally stocky & short-legged. 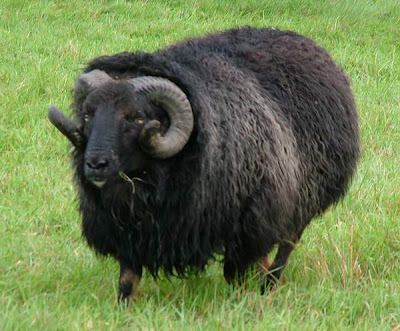 Their fleece has a double coat, usually ranging in colors from black, brown, grey, or white. Their faces & legs are bare, or without wool. "Bare-faced & Pregnant" is my normal condition in the Spring! 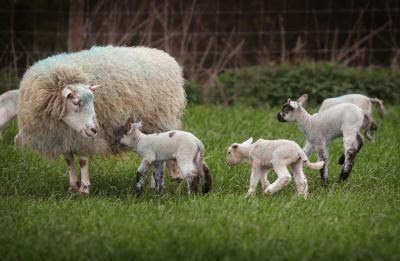 Lambing & Springtime are perfect together! 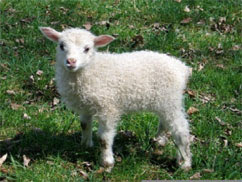 Ewes are able to lamb multiple births quite successfully, due to a gene they carry called the Thoka gene. 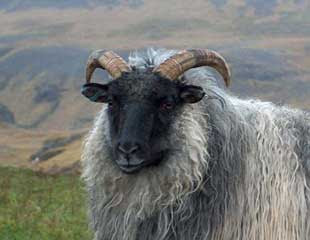 The Thoka gene, present in Icelandic sheep, is known to cause a higher rate of triplets. If a ewe has 2 Thoka genes, then there is an increased chance of lambing quads, quintuplets, & even sextuplets! 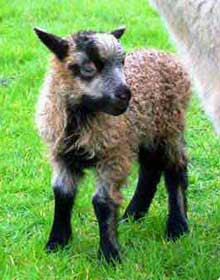 The Thoka gene was named for the first ewe it was discovered in. Lambs mature early & begin lambing at 11-12 months.They continue lambing for about 10 yrs.! Obviously, during Spring, Icelandic sheep are very productive. I feel like the "Old Woman in the Shoe"! 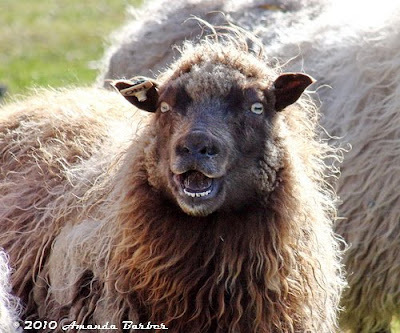 I just want to be a Sheep ,Baa, Baa! Ewe need to know that I watch my KIDS! doting & caring mothers. They are quick to claim their 5-7 pound bundle of joy, cleaning it, bonding with it, & carefully watching it's every move. 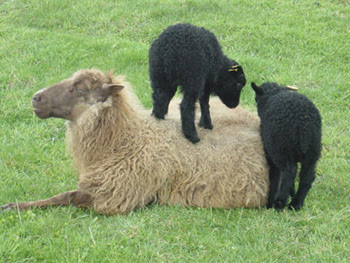 Icelandic ewes are definitely prime candidates for a "Mother of the Year" award! Is it time for dinner? Ewe know we are really hungry! Giving multiple births is not easy! Ewe have to be "Strong like Bull." Sheep are literally "full of life" in the Spring of the year. Lambing is an exciting, yet busy time for the Shepherd. He or she needs to always be on call to assist the mother ewes, as they deliver new life into the world! It's an exciting reward they always enjoy receiving. No Kidding, Life is GOOD! As Ewe enjoy the change of seasons, thank Ewer Shepherd for His "Watchful Eye" over Ewe. Give thanks today for such an attentive Shepherd, who daily cares about even the smallest details of Ewer lives! "To everything there is a season, A time for every purpose under heaven: A time to be born, And a time to die;" Eccl 3:1,2.